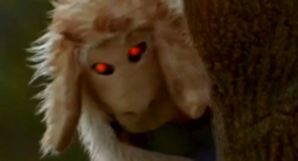 The Sheepshifter is a mysterious monster of Godville. The Sheepshifter is known for using its chameleon powers for the purposes of sheep rustling. Taking the form of a powerful ram, it infiltrates a herd. Then, with promises of greener pastures, beautiful ewes, and freedom from shearers, it convinces the herd to follow it to its lair. It may assume any one of a number of shapes, but is often given away by its glowing red eyes, its preference for high quality knitwear, and the whiff of roast lamb. Whether it has a natural unshifted body form is a matter of speculation among scholars. The wolfist school has lost credibility in recent years to the amorphous school, following Little Red Riding Hood's admission that the wolf wearing her grandma's nightwear wasn't using any chameleonic powers.